Newly elected Municipal Chief Executive (MCE) for Okaikwei North Municipal Assembly, Nii Boye Laryea has vowed to clear hawkers along the George Walker Bush Highway, also known as the N1 Highway. 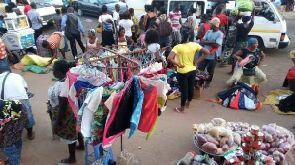 The MCE has observed it is particularly necessary to get rid of those hawkers at the Lapaz stretch of the highway which has been turned into a business hub, especially at night. According Mr. Laryea, he will not wait for the unfortunate incident that took place at Ashaiman where truck loaded with cement block ran into traders killing one and injuring others to play back at Lapaz. “I am much focused and will make sure that those who are plying their trade on the pavements along the N1 Highway, especially around Lapaz, are removed and relocated. I will not wait for what happened at Ashaiman not long ago to happen here. I know it will not be easy but we will have to take this bold decision,” Nii Boye Laryea said on Mantem Mpuntuo, a community development programme on Onua FM. Few weeks ago, an amateur video emerged on social media showing a Kia truck loaded with cement blocks ran into traders and was later discovered it killed one and injured six others at Ashaiman. Hawking on the Lapaz stretch of the George Walker Bush Highway has become an albatross on the neck of city authorities. A documentary by TV3 titled “Dangerous Highway” captured the dangers that high way posed and called for intervention. Several attempts have been made in the past to remove them but to no avail. The street market keeps expanding daily, forcing pedestrians to compete with vehicles for space. But Nii Boye Laryea said that situation will soon be a thing of the past as plans are far advanced in ensuring that the pavements are rid of with petty traders. He explained that although some people are expecting that the traders are removed with force, he will show a human face in his approach to avoid “creating unnecessary tension”. Items such as second hand clothing and shoes, cooking utensils, fruits and vegetables, tubers of yam and cassava, travelling bags are among a host of other items displayed every evening on the pavements to attract buyers. Fast food vendors can also be found operating on the pavement both day and night. The MCE described the situation as an eyesore that needs immediate attention. “The situation there is not good. We cannot keep them there any longer that is why I am going round with my team from the Okaikwei North Municipal Assembly to see what we can do to relocate them”, he said. “When we keep saying there is nowhere for them to go and they continue to do business on the pavements, we will wake up one day to horrific scenes of a reckless driver running into those hawkers, is that what we are waiting for?” he quizzed. “I will plead with the hawkers and the general public to comply with our resolve to clear the streets,” he urged.